The color I chose was teal. Pallet created by Jessica Colaluca of Design seeds. Decided to use only the first three colors in my pallet, mainly because I couldn't seem to match the darker blue. As a seed bead freak, I naturally created my piece using two colors of teal seed beads, and the ivory colored pearls. Very splendid use of your palette! This was a challenge for sure! Such amazing seed bead work. I how you framed the bigger pearls with the smaller ones. The necklace reminds me of a winter garden. That is beautiful seed beadery! I have a healthy fear of those little beads, mainly that I lose my eyesight when I work with them and also that I am clumsy and frequently spill them on the floor! ;-) I am quite in awe of what seed bead artists do to wrangle them into such pretty submission! Thank you for playing along in the challenge! CJ, your neckace is very pretty I really like your design. Your necklace looks fit for a princess! Delicate & beautiful! What a lovely design! And you used your colors perfectly! Lovely necklace! Love the romantic and wintery feel of it. Great interpretation of the colour palette! Very pretty! It's always good to see someone play with the seeds! A very pretty piece. Nice and light, very delicate looking. 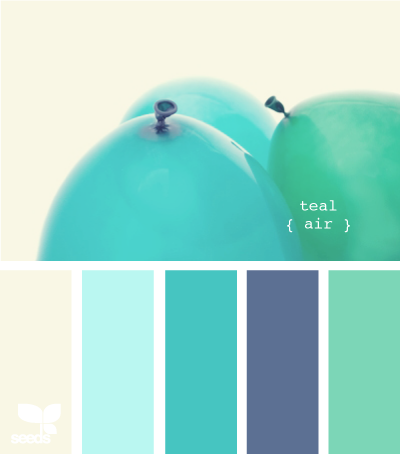 Really love this color palette! Very delicate looking creation, nice job! Its has a calming vibe. It's so pretty - it looks like super fancy wedding cake decorations! What a beautiful necklace! Reminds me of something a princess would wear! Your bead work is stunning, well done. Such a dainty, delicate look you achieved! The pearls are set off beautifully by the green/blue of the seeds. Gorgeous beadwork! You have such a gift :) Sweet, beautiful, and oh so delicate. Lovely. Hats off to 'seed bead freaks', you do a wonderful job with seed beads. A beautiful feminine necklace. What a lovely necklace, your bead weaving is beautiful. As someone said earlier, fit for a princess. That is so beautifully intricate and a lovely interpretation of the pallette. I can only imagine all the work you put into that necklace! Beautiful delicate work you have created with all those tiny beads! They scare me witless! Great match for the palette...I don't think you had to use all the colours. Your palette is soooo yummy and your necklace is just as beautiful. It's so very delicate and romantic... Well done!